If you’ve been to London recently you might have seen ME London – Meliá’s smart new hotel (designed by Foster and Partners) on The Strand – on the site of what was once the Gaiety Theatre. It’s on my wish list to visit – if only for the amazing views of London while having a drink at the Roof Bar. The new ME brand stands for contemporary hotels that are designed (in some style, it must be said) to meet the needs of guests for whom a hotel isn’t just somewhere to eat and spend the night, but a lifestyle choice. As a guest in one of these hotels, you even enjoy the services of what’s called an ‘aura manager’. I would really like to write a ‘day in the working life’ article about one of these aura managers; I’m sure it would be fascinating to know what’s involved . . . The luxury brand can currently be found in London, Madrid, Dubai, Cancún and Los Cabos in Mexico, and Meliá intends to open more ME hotels in the world’s most important cities and ‘leading tourism destinations’. Mallorca has had its own ME hotel since 2014. It was the result of the redevelopment of the former Beach House (also a Meliá property) in Calvià Beach Resort into the new upmarket brand. The hotel has 206 rooms, 78 ME+ suites (with extras including private check-in, Nintendo Wii, ironing service, and pre-dinner cocktail), exclusive Suite ME, two swimming pools, and Skinc spa. If you can’t find Calvià Beach Resort on your map of Mallorca it’s probably because it’s the new name for the southern end of Magaluf. With the infamous reputation of the party-hard resort – and its negative impact on Mallorca’s image as a tourism destination – it’s no surprise that this end of the large sandy beach is being reinvented for a different, more affluent type of visitor. 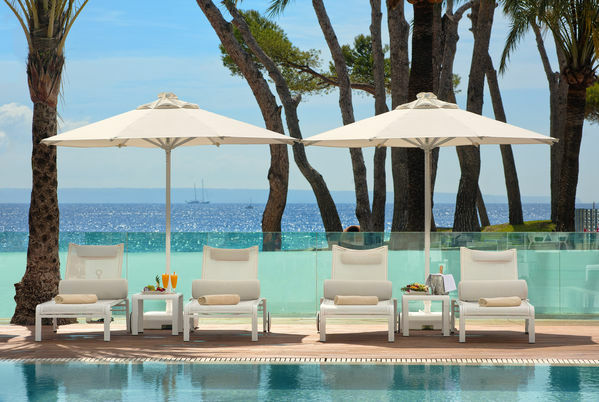 Or that Meliá Hotels International – a company which began here on Mallorca in 1956 – is involved.